Holiday accommodation is often cheaper and more homey if you go with a vacation rental like the ones from AirBnB. And if you go for shared housing, you might get to know some cool locals. The shared kitchen is another plus; it’s typically equipped with pots, pans and spices, all ready to use. In one AirBnB share house where I stayed, there was even a free-for-all shelf, which contained stuff left behind by previous AirBnB guests. It had everything from pasta, pancake mix, barbecue sauce, tomato paste, bus tickets, tampons (!) and body lotion. 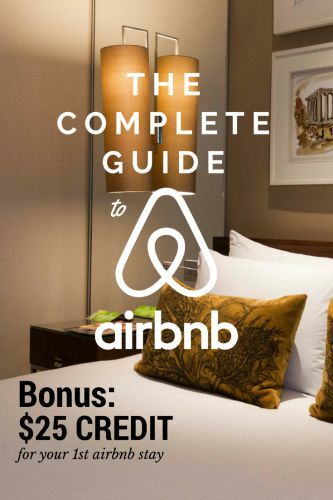 Get a $25 AirBnB coupon — sign up now! Whenever I move to a new city, the first thing I do is hop onto AirBnB to find a temporary place to stay. I also always check AirBnB for shorter trips. 1. When I open the AirBnB website, all I have to do is enter my destination city, dates and number of guests. 2. 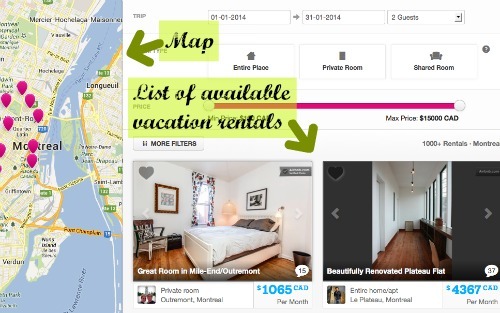 AirBnB then generates a list of available properties and shows where they’re located on a map. 3. At this point, I usually narrow down my choices by room type and price using the slider. 4. I browse through each remaining listing, checking out the photos, the description and the reviews. If I like what I see, I send a message to the host to check for availability and ask for more details, if necessary. 5. If I really like what I see, I book the place without waiting for a reply to my message. This way, the host has to either accept or deny my booking within 24 hours, or it expires. I simply follow the instructions on the screen to complete the booking. 6. Once the host accepts my booking, AirBnB charges my credit card and all I have to do is get there. Money-saving tip: If you’ll be staying for more than one month, book through AirBnB for just the first month and let the host know that you might extend your stay later. This way, you won’t be tying yourself down to a potentially crappy place; you can leave after one month if you hate it there. Also, you’ll be able to deal directly with the host after the first month and not have to pay the AirBnB fee. You can still book your AirBnB stay using the steps above, but there’s now an additional feature than can make the booking process much quicker and easier. Pay attention to the lightning icon beside the price on some listings. This little icon will make your life a lot easier. 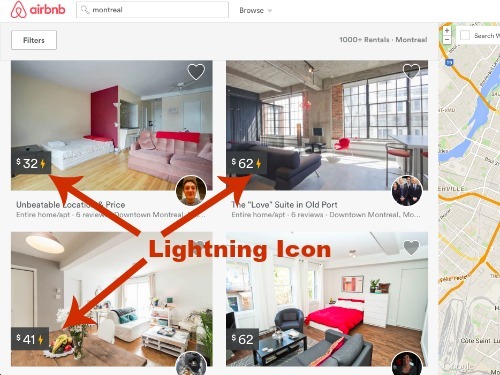 A listing with the lightning icon means that the host accepts instant bookings. 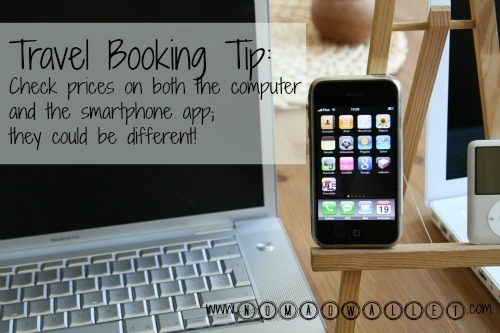 Once you make a booking, it’s instantly confirmed without you having to wait for the host to approve it. In the search results page above, you can see that there’s one listing that is not available for instant booking. 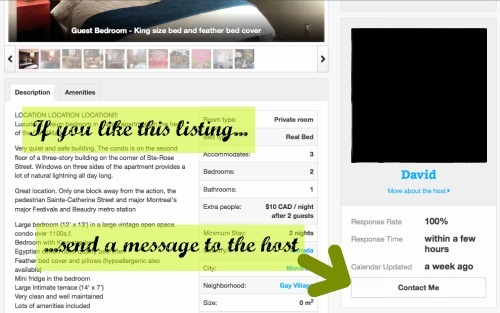 Unless there’s one non-instant listing you really like, you may want to filter your search results to only show listings where the instant booking feature is enabled. 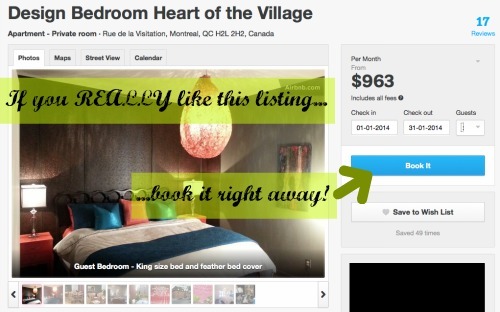 Add a checkmark in the little checkbox that says “Instant Book” and you’ll only see listings that you can book right away. After you make an instant booking, you can send a message to the host to talk about when and how to check in. Most hosts would also be happy to share some travel tips. Tip: You have to upload a profile photo to be able to access the instant booking feature. 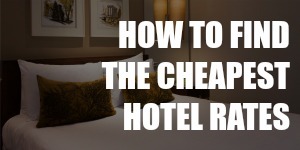 If you’ve only ever stayed at hotels, AirBnB can seem scary. But don’t worry; there are safety measures in place to make sure that your stay is safe. Every AirBnB host has to create a profile and verify their identity. There’s also a rating system that previous guests use to review the hosts, so I know what to expect from each host. AirBnB also offers a secure payment platform. I pay AirBnB at the time of booking and AirBnB then releases the money 24 hours after I check in. If something seems fishy, I can request a refund and, if approved, AirBnB may release the refund or book another place for me. My main gripe with AirBnB is how difficult it is to actually get a confirmed booking, especially if I’m traveling to a popular destination. I began sending messages to hosts on AirBnB about six weeks before my departure to Montreal, but only got an accepted booking a few days before I left. It was crazy. I must have contacted 30 hosts before getting a confirmation. At first, I sent one message and waited for a reply before contacting another host. Before long, I learned that just wouldn’t work. I could wait for days to get a reply saying the room wouldn’t be available because the host’s family was visiting or because the room had been rented out. So I started booking one listing without messaging the host first and sending messages to all other hosts within my price range. This accelerated things because the host whose listing I booked had to respond within 24 hours. If one booking fell through, I went ahead and booked another one immediately. Rinse and repeat until I finally get a confirmed booking. I still find AirBnB quite convoluted, to be honest, but that’s only because these hosts are not professional hoteliers, nor do they intend to be. Both the prices and the “customer service experience” reflect this fact. 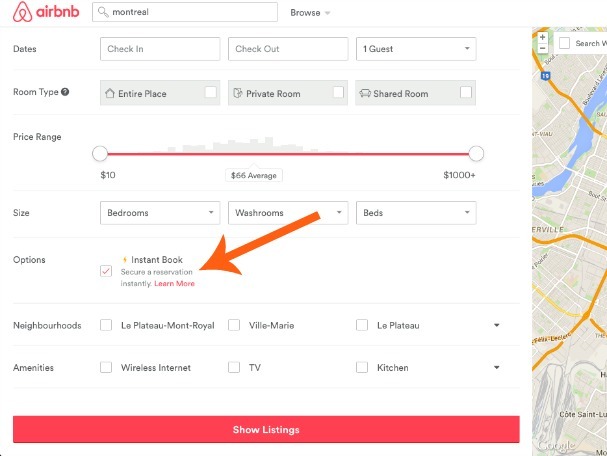 Update: You can now easily get around this problem by only choosing instant booking listings. Check out the Instant Book section above if you missed it. The availability and prices on a single AirBnB listing could differ when I check it on my laptop and on my phone, so I browse on both gadgets to make sure I get the best price. I’ve found that laptop prices are generally better, though. Maybe the phone app lacks certain functions like how to calculate prices based on monthly rates instead of the default nightly rates. I know some of you are thinking about this, so let’s get this out of the way. At some point, every AirBnB user tries to come up with a scheme to deal directly with the AirBnB host and avoid the AirBnB fee, while still enjoying all the protection the website provides. If such a loophole exists, it would render AirBnB unprofitable. The company will fail to generate revenue and close down and we wouldn’t be having this conversation. In other words, it won’t happen. There’s no way to undercut AirBnB and secure your booking with the host without incurring the AirBnB fee. 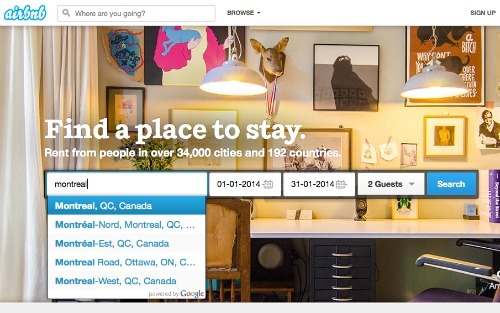 If you cancel a booking, AirBnB will still retain its fee, so you wouldn’t get a full refund. At a time when many online services come for free, it’s a bummer to have to shell out money for anything. But I think AirBnB deserves its fees for creating a system where it’s possible to safely live with strangers. Technically, if you’re willing to take a chance and trust a stranger, you could always contact the host outside the AirBnB messaging system. For example, you could search for the host’s profile on Facebook, identifying him using his location and profile picture. But in many cases, you won’t be able to meet the host or visit the property before you pay for your stay, so you could expose yourself to danger this way. And if this is a risk you’re willing to accept, then why not go with Craigslist instead? If you want to try AirBnB, I have a $25 coupon code for you. All you have to do is click this referral link and sign up for free with AirBnB. In the spirit of total disclosure: AirBnB will also give me a $25 credit when you make your first booking of at least $75 and I’ll love you for it. 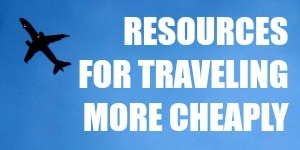 Need more vacation rental choices? I’ve found AirBnB to have the cheapest and the highest number of listings, especially for private room listings (as opposed to entire apartments or houses). I used to have a list of other websites that offer vacation rentals, but I’ve always come back to AirBnB. 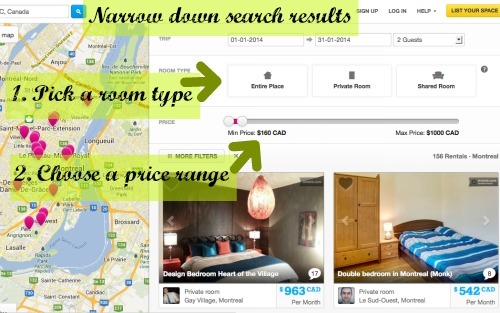 If you want to perform a quick search regardless, use Tripping, a search engine that covers multiple vacation rental sites. Images: 1 & 9. (Free License); 2-6. Nomad Wallet; 7. (gif via fyeahbigbangtheorygifs.tumblr.com); 8. Photo © 2010 J. Ronald Lee (CC BY 2.0 License); 10. (gif via gifrific.com). That’s really strange! In Montreal, the McGill girls who actually lived in the house all went to New York for the summer. It was just us and another AirBnB guest in the house. Super weird! I just started using AirBnB recently. My first booking was in May this year and boy, it was a pleasant stay. I just realized that I could get discount/coupon code for my first trip. Since I didn’t use it during my first booking, I wonder if I still can use it for my next booking? Hi Khalisah, I’m not sure if AirBnB will allow that. I suspect it may not be possible, unfortunately. I tried reading AirBnB’s terms and conditions regarding this offer, but there’s nothing about this either. If you travel with someone, I suggest you use that person’s name to make your next booking. Or you may be able to get around it by creating a new account so you can use the discount code. I think that sharing economy is the way to a brighter future because it solves the main problems of nowadays capitalism as well as it breaks the barriers of individualism. Sharing is a natural behaviour of the human being and it adds special satisfaction to life. I love to see how shared economy can open doors for people, because now we are remembering that together we can do more than by ourselves. With the high prices of rentals and rooms, sharing homes is a great way to reach things and places you couldn’t have on your own. I have done it more than once through magicrentals . co . uk and now I just don’t want to go back to traditional hotel booking. I have found my new way. That’s a great article on home exchange too! 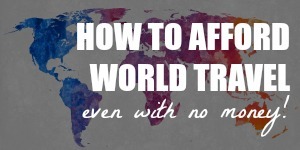 Nice work :) Home exchange is a good budget way to travel, but I love that it also means you build friendships with people from all over – making the world a smaller and more accessible place. Gotta thank the internet for allowing us to make friends and build trust with new people from all over! Very useful guide!! :) I’ve never tried AirBnB but some of my friends have and they really seemed to like it, so I’d definitely like to check it out in the future! Uuuuhhh, lots of goodness here… We’ve used both VRBO and AirBnb only once, and had lovely experiences. They were not very cheap though… In our current neck of the woods (Central America), we’re seeing more options through the ol’ “ask around/walk around” method. Nonetheless, we’ve seen some good deals on AirBnb while browsing the interwebs, so we’re bound to use it again. Fantastic (and informative to boot!) post, Deia! Good luck! That’s a good point. In places where people are less likely to advertise online, it would make sense that you’d get more options by asking around. I’d want to secure accommodation before getting there for at least the first month before asking around for better/cheaper lodging, though, and that’s where AirBnB would come in for me. In Canada, I’ve found AirBnB rates to be quite low; similar to what you would get for local rents. I’ve even seen good prices for Bali on AirBnB, but then again that’s quite a touristy place too. That’s an interesting insight on the reviews. I guess knowing that you’re reviewing a person whom you’ve met also makes it harder to leave a negative comment, as opposed to reviewing a faceless corporate hotel. It sounds like you had quite a bad experience though. How good or bad your experience is really depends on the host with AirBnB. yeah definitely! We have decided for longer stays, holidays rentals such as airbnb are worth the risk. For shorter stays, it is not worth the risk. We wasted too much time with only a couple of days in Miami dealing with it. Oh yes, that’s another thing. Depending on the host, getting a confirmed booking can take so much time that it might only be worth the trouble for longer stays. Spending weeks to contact various hosts was worth it for me because I was staying for more than one month. I’ve used AirBnB 6 or 7 times over the past year and a half, staying in full apartments, houses, and private rooms. For the most part, I’ve been very satisfied. I look at the ratings, especially on Cleanliness – sometimes visitors won’t leave a comment that says “this place is dirty!” because it’s a public feedback, but they will dock the host on the stars because that’s aggregated. If a place has less than 4.5 stars on Cleanliness, I don’t book it. Another thing I check out is the negative reviews, if any, and then I look for the host’s response to that negative review and his/her review of that guest. There are some cases where the response was completely out of proportion and the host just went ballistic on the visitor. I don’t book those either. I’ve heard great things about One Fine Stay, may try that next time. It can get addictive, AirBnB. So much more homey and cheaper than hostels. I’ve stuck with private rooms and I’ve been satisfied overall, too. Great tips with the ratings and reviews! I once stayed at a place that had no reviews yet because it was a new listing. (I had no choice because the departure date was getting closer and I had problems getting a confirmation.) It turned out to be quite dirty, but it was also a very well-located historic building. And it was dirt-cheap, so I guess I feel okay about that place. Let me know how it goes with One Fine Stay! From what I’ve seen, Airbnb has by far the most listings and the most active hosts, even if you sometimes find lower rates on other sites. Good to know! Seems the other websites haven’t figured out how to make it easy to book either. Maybe AirBnB is still the best alternative then, despite its shortcomings.